Catchlight Painting offers commercial painting services throughout the Greater Boston Metropolitan Area. Our services include both occupied and unoccupied commercial spaces, interior and exterior. Our attention to detail and extensive knowledge of surface preparation provide beautiful, lasting results. We understand the inconvenience that having a working crew on your property can cause, and are prepared to work around your schedule to avoid disruptions. Our team will respect your property and keep the work space safe and tidy. With our highly capable crew of men and women, you can expect efficient, friendly service and enjoy the peace of mind that comes with hiring a fully-licensed, insured, and dependable commercial painting contractor. We carefully screen all employees with background checks and drug test. We train all employees, regardless of their experience, to ensure all work is performed to our high standard. We partner with other trades to offer seamless solutions to the hiccups that might otherwise slow a project – carpentry, roofing, electrical, plumbing, hardscaping. We stand behind our work with a 3 year guarantee. We offer flexible scheduling and robust back office support to ensure projects are carefully managed and completed successfully and on time. The health of our crew, and your property’s occupants is our top priority. 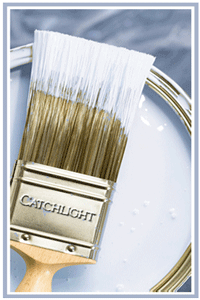 Catchlight is an EPA lead-safe certified commercial painting company and adheres to all OSHA safety standards. We can bring sophisticated air management tools and protocols to your project to minimize or eliminate disruptions. Call us to get started, or simply contact us using the button below. Paint & Materials On The House!